Your smile is one of your best assets, and you probably have some great habits, like brushing and flossing, that protect it against decay. However, your teeth could still be in danger. Everyday activities may pose a threat to those precious pearly whites of yours. What are these activities, and what can you do to minimize the risk to your chompers? Your dentist in Mesquite is here to give you some friendly guidance. Some people have reflexes like a cat and avoid even unexpected obstacles like nobody’s business. Most folks, though, have at least a dash of clumsiness. 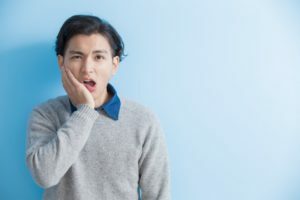 Whether you’re walking around the office and don’t see the cord on the floor, or you accidentally trip over that curb in the parking lot, falling down can cause some major damage to your teeth. The lesson here? Please watch your step. It’s especially important to be cautious when you’re riding your bike — in fact, cycling is a leading cause of tooth loss! Do your best to be aware of your surroundings so your smile stays intact. Mindless snacking can damage your teeth! Accidentally biting down on that unpopped popcorn kernel or finding that unexpected piece of bone in a “boneless” piece of meat can spell disaster for your chompers. By being aware of what you put in your mouth, you can reduce the chances that you’ll end up chipping a tooth. When you’re desperate to get that tag off your brand new shirt but you don’t have anything sharp handy, you might be tempted to take your teeth to that little plastic nuisance. Or you might want to get even out your broken nail by biting on it. Don’t do it! Teeth should only be used to chew on food, not as a substitute for handheld tools. Think about carrying a pocket knife and a pair of nail clippers with you so you won’t even consider using your pearly whites as a cutting machine. Okay, everyone wants to impress others with the way they look, but some fads are downright bad for your teeth. Lip and tongue piercings can hit your pearly whites and cause them to break or crack, especially if you take a hard fall or accidentally hit your head on something. When you want to go for an edgy appearance, please keep your piercings away from your mouth area. If you can, cut back on these drinks. At the very least, consider enjoying them with a straw to minimize the amount of contact the liquid has with your teeth. Want a beautiful, healthy smile? Use the above tips to protect your teeth from stains and breakage. Dr. Byron McKnight is proud to lead the talented team in our practice. Whether he is repairing a broken tooth, helping you fight stains, or just performing a checkup, you can expect top-notch service. If you have questions about how to care for your smile, please contact us at 972-698-8000.